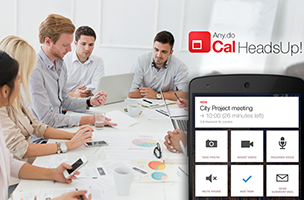 Any.do has announced a significant update to its calendar app Cal on Android devices, introducing a meeting-focused feature called “HeadsUp” to users. HeadsUp aims to help users before, during and after meetings, offering them access to the tools they’ll likely use during meetings, and eliminating the need to quickly swap between apps to complete basic tasks. Before meetings, HeadsUp allows users to navigate via Google Maps, call a taxi, email a message to a meeting’s attendees, or send a quick message letting everyone know they’re running late. During a meeting, HeadsUp offers a variety of buttons, including one to mute the phone, and others to quickly turn on video or audio recording. The feature also offers access to task lists, for adding tasks as soon as they come up in conversation, the ability to send summary emails to all of the meeting’s participants and access to the camera to take pictures of slides, whiteboards, etc. Once the meeting is complete, HeadsUp allows users to set follow-up meetings for everyone involved, send email summaries to make sure everyone is on the same page, or add and send “action items” to peers. The HeadsUp feature set is now available in Cal on Google Play, and will come to the iOS version of the app in the future. Check back soon to follow Cal on AppData, our tracking platform for mobile and social apps and developers.